This legendary A-frame tent is an all time family favorite. Over 1 million sold! Sleep 8 people comfortably in this 156 sq. ft. tent. This cabin style tent offers much more usable space than typical dome tent designs. Straight walls offer more head room and allow campers to push cots and gear closer to the walls and out of the way. 75D StormShield polyester fly features clear panel skylights for stargazing and pockets for storing storm guyouts when not in use. 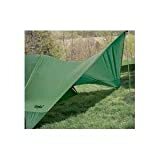 Corner zips on the fly allow for easy attachment of the included awning system. 6 large zippered windows open for excellent visibility and airflow and close for privacy. Easy to use toggles keep window flaps off the floor and out of the way! Additional features include steel and fiberglass poles for durability and pole sleeves, frame clips and ring and pin assemblies make set up a snap. Nickel sliders and self-healing zippers will provide years of trouble-free use and factory-taped major seams help to seal out the weather. Special touches like the E! Power Port for an extension cord (not included) and a handy sweep-out point make this tent extra friendly for those campers who want some of the conveniences of home.